Competition #2 for the season was Hall of Fame. This was also the very first competition Grace ever competed in with Eau Claire School of Dance (four years ago), so it’s a bit nostalgic for us. Every year we go, this competition seems crazier and crazier! It tends to draw some of the best studios in the Twin Cities – Larkin, Woodbury Dance Center, Northern Force, Kinkade Dance Industries, Studio 4, Northland School of Dance, and Music General, to name a few (ok, more than just a few). It was also the competition we first saw and fell in love with Lake Area Dance Center. The incredibly high level of talent we get to see is my favorite thing about this competition. Hall of Fame had 2 stages going on simultaneously. Despite the number of dances happening at the same time, it still stretched out over 5 days. That’s a LONG competition, and can make for late nights for dancers who have school the next day! Sometimes, studios had 2 dances scheduled on opposite stages at the same (or close to the same) time. That makes it difficult for studio owners/teachers to manage schedules. We even had situations where we had the same dancers scheduled on 2 stages at almost the same time. The competition managers made it work, but how stressful for those dancers that didn’t even know which dance they’d be performing first, and then making the super fast change. My daughter did not have to worry about any of those situations, luckily. Our biggest scheduling issue, was that we had to be there on 3 separate days for Grace’s dances. Not a big deal, because that meant more amazing dances we got to watch, but it was a big time commitment. Prices at this competition were a little higher than usual. It cost $15 for a program. Granted, it IS very thick, but still, I prefer to stay around the $10 range for the program. Some competitions charge that, AND include a pen with highlighter on one end. The program does not include any spaces to write in the awards, so I had to fill the margins with all the extra awards, overalls, and Best in Category. I wouldn’t be so grumpy about paying the extra if there were boxes or extra space to write in awards. This would be an improvement they could make that would be very helpful, especially considering the lightning fast pace the awards ceremony goes. The apparel was also an average of about $5 more than at other competitions. On the upside, you can order their apparel online if you didn’t want to get it that day. They do have some super cute apparel available! The venue this competition was held at, was the RiverCentre, in downtown St. Paul. Because of the downtown location, and the fact that it’s connected to a major sports/concert venue, means we have to pay for parking, and it’s not cheap! It also means they were likely to have over-priced food ($4.50 for a popcorn, $2.50 for a can of pop). This makes for a fairly expensive weekend, even if we bring our own snacks. That said, I realize, we are lucky enough to have competitions in the area we can drive to each day, rather than pay hotel, etc. for multiple days. The two stages I referred to are back to back, so makes going back and forth between stages easier than other competitions I have been to where you have to run down the hall to go between stages. There are dressing room areas all over the place. It’s nice to have plenty of space for the girls to both change, and to practice. Some awesome things about this competition: they offered a “studio package” where we can get all the videos from our studios’ dances, and all the pictures from our dancers dances for a VERY reasonable price. Last year I paid significantly more than that for just the dance pictures (that is, until we were offered the studio package last year, after which, they refunded the difference). Their photographers are generally fantastic. We’ve gotten some really great pictures from there! Our studio has a lot of props this year. While we do have a fabulous crew of Prop Dads (and teachers and assistants who help), it was much appreciated that Hall of Fame has a crew of men to help move props on and off stage. I heard several people comment on how fast the props were getting set up and taken down. Kudos to their crew for all their help! Since Hall of Fame is notorious for running an hour or more ahead of time, I really appreciated that this competition has text alerts you can sign up for. The alerts would come usually about 10 songs before the awards session, and sometimes about 3 songs before. They would not only tell you how many numbers before awards, but also how far ahead they were on each stage. This was very helpful for both parents and dancers, but also to tell relatives who wanted to come watch. Probably my favorite feature of Hall Of Fame, is the opportunity to watch online via Livestream. We took advantage of this option quite a bit. We watched some of the mini dancers in the morning before we had to head downtown, and we watched from home on Sunday, after Grace was done dancing. I know several relatives and members of Eau Claire School of Dance watched Grace online too. It was very cool to know people who couldn’t be there were still watching and cheering her on from afar! There are four divisions: Future Hall of Gamers (8 & under), Rookie League (Recreational), National League (Intermediate), and American League (Advanced). Every dance will be given a rating based on their score. The highest possible score in the American League is Grand Slam. The next highest rating is Platinum (this is the highest in all other divisions). Next comes High Gold, Gold, and finally, High Silver. A first place notation is given to the highest scoring number in each category (by specific age and style of dance). After giving the “adjudications” (rating), the dances were then rated in the overall category. This would be where all the National Level, Junior Level dances are ranked 1st, 2nd, 3rd, etc. The number of rankings depends on the number of entries. Grace’s tap small group danced Friday night, and got 1st Place Platinum. 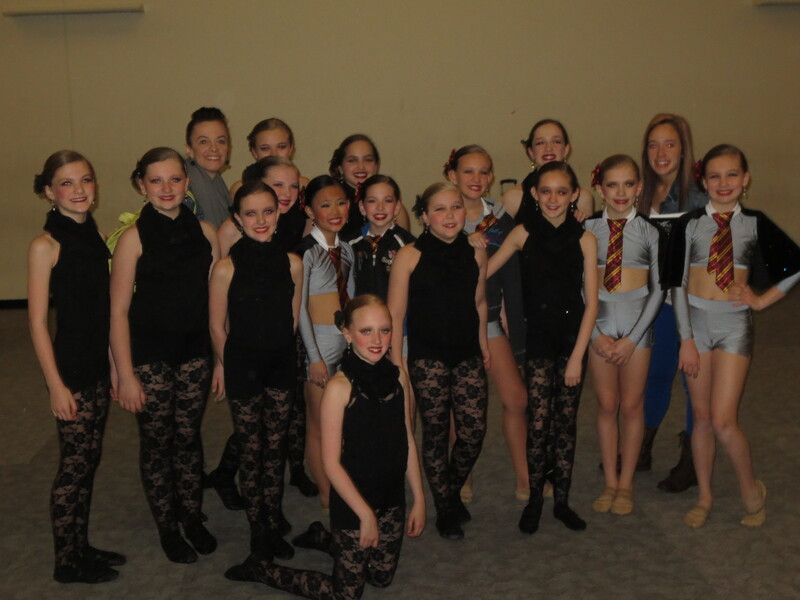 They also got 2nd overall, and on Sunday, they were announced as tying for Best in Tap. Saturday, almost the entire competitive group danced their production number. They scored 1st Place Platinum, won a choreography award, and took first overall! Sunday, Grace’s 3 large groups danced. All three scored 1st Place Platinum. Their contemporary dance was oven an Intensity Award, and scored 3rd overall. Their tap dance tied for 4th place. Their jazz dance got 1st overall, and Best in Jazz! Over all, Lake Area Dance Center did very well. Many dances placed, were given special awards, and took Best in Category for the National Level dances.